The reason may be that for some reason, the Studebaker wrecker could not be made any more (broken tool ?). When this happened Meccano had started working on the 35a CitroÃ«n U23 dÃ©panneuse which was still several months away. â€¢ The 1954 catalogue still shows the Studebaker. 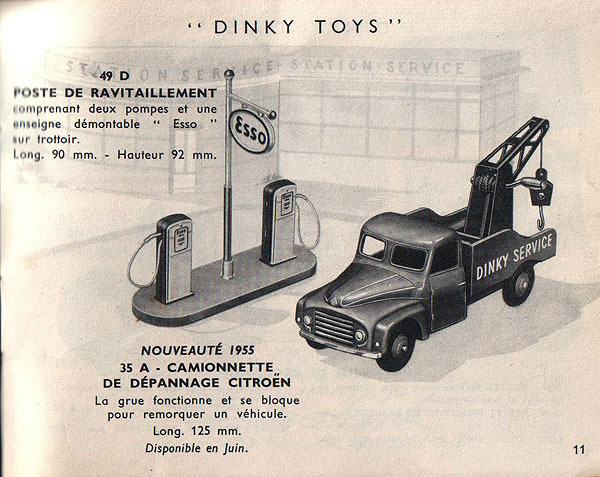 â€¢ The 1955 catalogue already shows the CitroÃ«n which was issued in June as stated on the catalogue. The Ford was not planed it was very easy to make it to fill the gap. Every part was available at the factory, the only jobs to do were flaten the rear pannel and make a rubber stamp for the marking. I can not think of any other model with such a short life.